This post was written by Khalid Ibrahim, executive director of the Gulf Center for Human Rights, an independent, non-profit organisation that promotes freedom of expression, association and peaceful assembly in the Gulf region and its neighbouring countries.Prominent Bahraini human rights defender, Nabeel Rajab, has been in jail for his human rights work since 13 June 2016. He is currently serving a two-year prison term for speaking to the media about the human rights situation in Bahrain. He also faces additional prison time for expressing himself on Twitter. Rajab is the President of the Bahrain Center for Human Rights (BCHR), the founding director of the Gulf Centre for Human Rights (GCHR), the Deputy Secretary-General of the International Federation of Human Rights (FIDH), and a member of the Advisory Board of the Middle East and North Africa Division of Human Rights Watch (HRW). In July 2002, he founded the BCHR with his colleague Abdulhadi Al-Khawaja, who is serving a life sentence for his human rights activities. The BCHR continues to operate to this day despite a decision to close it by authorities in November 2004, and the jailing of its two founders. When the popular uprising started in Bahrain on 14 February 2011, Nabeel Rajab was at its heart as a human rights leader. When the authorities arrested most of the uprising leaders, he became the only remaining voice outside of prison, which was heard by hundreds of thousands of followers on Twitter and the rest of the world, attesting to the grave violations committed by the government that oppressed the entire population solely based on their demand for freedom, equality and social justice. For his engagement with the Bahraini uprising and human rights activism, Rajab is paying a heavy price. He was arrested and imprisoned several times and subjected to various types of threats, judicial harassment, abusive media smear campaigns, torture, and travel bans. On 10 July, he was sentenced to prison for two years after being found guilty of spreading “fake news”, over TV interviews in which he spoke about mounting human rights violations in the Gulf kingdom. In those interviews, Rajab talked about journalists and NGOs being prevented from entering Bahrain, and a lack of judicial independence. On 22 November, a Bahraini appeals court upheld the two-year prison sentence. 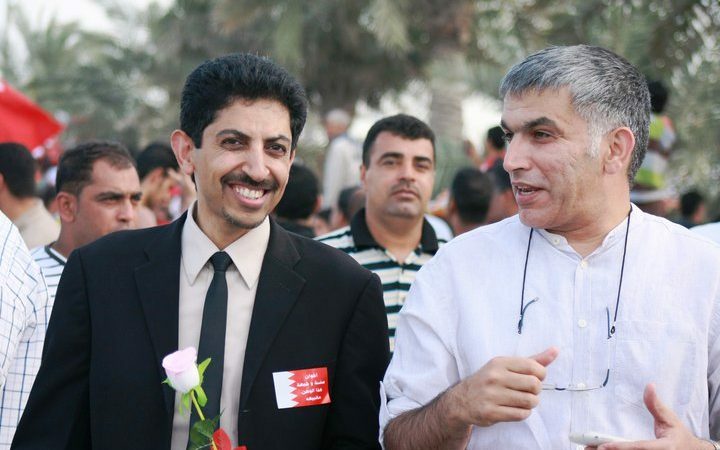 In another case, Rajab faces up to 15 years in jail for criticizing Bahrain’s participationin the Saudi-led war against Houthi rebels in Yemen, and for speaking out about torture in Bahrain’s infamous “Jaw” prison on Twitter. Rajab was scheduled to appear again in court on 31 December 2017 for this case. However, the hearing was unexpectedly held on 5 December, four weeks earlier than the date originally scheduled by the court. On 3 December, Rajab’s lawyers were informed by the court the hearing would take place on 5 December, under the pretext that a key witness in the case would be unable to attend the hearing on 31 December. Although, Rajab’s lawyers protested this decision, the hearing took place on 5 December and was adjourned to 7 December. Rajab was unable to attend the hearing for health reasons. On 7 December, the hearing has once again been adjourned to 15 January. Rajab faces additional prison time for charges related to two letters he published in the New York Times and the French newspaper Le Monde, while in prison. Despite these calls, Rajab remains in prison. He is not the only one in Bahrain to be jailed for his human rights and political activism, or for peacefully expressing himself. In the small island kingdom of just 1.4 million people, there are more than 4,000 political prisoners, according to rights groups. Why let the Muslim people have rights if there is a possibility to impose/bend them under the laws of the Sharia and this way to make them servants without the ability to express themselves. This is the way of the Quran and their Muslim leaders. the people go after them like blinds. It is time to change it and to pull the Muslims to the modern world. I am not sure if it will work. the point is the education and as long as it will not change-the Muslims will stay behind. I agree with you. Because ‘fundamental’ Islam wants to keep the followers of it living in the 7th century I do not know if it is possible to educate the ‘base’ of Islam. When I was in Junior High School my Football Coach had a saying, it was ‘you gotta want to’. The concept was, he who wants to the most, tends to win most of the games. If a person doesn’t ‘want to’ there is not much you can do to help them.—Thank you very much for reading their article and for taking of your time to comment, I appreciate you.